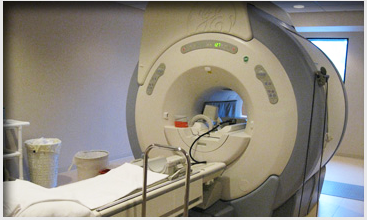 MRI combines a powerful magnetic field with a sophisticated computer system and radio waves to produce detailed pictures of organs and tissues, without the use of radiation, in order to diagnose a variety of medical conditions. The images created are sharp, clear and 3-dimensional. The procedure is safe, painless, and, because of the superior clarity of images, it allows for early detection and treatment of disease without invasive procedures such as surgery. There are no known side effects following an MRI examination and no special preparation is required unless specified by your doctor. Our short-bore, high-field scanner is open at both ends, well lit and ventilated. The image quality of the high field strength is superior and the scan times are shorter than the low field strength scanners. A 2-way intercom system and call button are used so you and the technologist are able to talk to each other during the exam. 2. Please come to your appointment 30 minutes early to allow for the completion of necessary paperwork.